I would love to see the gamer profiles more like a webpage. So we can see what games the people on our friends list own and have played the last number of days. You get five stars from me just for mentioning Home. I was about to be “first”! Anyways, cool stuff I guess. Will PSN ever update on the PS3 to have a more in depth player profile? I like to flaunt my imageinary greatness! Updating the “Gamer Card”? to have recently played games? Love the idea…always thought integrating the ID and the Web site was a natural fit…glad to see the online features are merging together to make the PSN a community hub…second hint about Home inside of a week? Good news all the way around. Please keep the updates coming! After the blog update, I was thinking that the main site needed a little refresh as well. Seems the Playstation Network team is on top of things! The ability to message someone on PSN from the website would be great and New PSN avatars is a must. Aww i’m going to miss PSU, I hope you guys don’t get rid of the forums :(. New avatars? Games played database? Also, what does this mean for GAP members? Is that being dissolved too? NICCCEEE, CMON SONY LAUNCH HOME W00T!! Cool. Cannot wait for the change. Ahh ! That’s Sweet! Please give us more avatars or let us use our PS EYE to make are avatars. Then we can truly customize are profiles. Yes! I hate having different passwords for different things. Heck, it was annoying having to sorta re-log into the playstation site to see my friends list. Although I’ve been a PS Underground member since 1996, I support this decision. For a while, I felt it needs to go to a single sign-in for everything and be able to access everything PlayStation. Also, I feel it will also clear out many in-active accounts (I wouldn’t be surprised if 75% of the current PSU users haven’t logged in for years). @ #19 I agree. And hopefully it’ll help flush some of the dirty forum trolls who’ve been harassing gamers for quite some time. Really great job guys. I really love how you are trying to expand the Playstation Network, and you are doing a great job with it. My one question is, can we do basic PSN function from our computer now? Can I send/receive PSN messages, check my friends trophies or what game they are playing, etc? Also another feature that would be cool is to have pre-downloads from your computer, that would start as soon as you boot up your PS3. Step in the right direction! and @14, no i don’t think GAP is getting dissolved, if you look at the picture, there is a button for it under the username. So these extra enhancements , what game specifics are we talking here? something that might blend with LBP? that would be cool. also, maybe, JUST MAYBE, something like the reward system for trophies? level 5 gets a cool swank bag or something? please link all those exclusive game devoted sites. I’d love to transition form the us.playstation.com site to the littlebigplanet site and the resistance site without having to log in again for each site. Thanks for the heads up Susan. Do you guys have a date for when Home open beta is coming out? These enhancements sound great! Good job keeping things fresh on the Blog and the Official Site. Like some others have stated, I think it would be nice to also have a trophy sync on the website so you can see friends, and potential friends, trophy collection. Now when are we going to be able to send messages to our friends, and see what they’re playing, and see our, and their trophies online? I suppose that’s in an upcoming phase? thats real nice to have this online feat. will we be able to have a friends list aswell, and be able to see if our friends are online while we browse the site. somthing like what XBOX.com dose in a way. This is great news Susan, thank you for letting us know. The new interface is dandy I tell ya what’ I got to get busy right now building my first level in LBP. Then frag some newbs in R2 with my damn Marksman. I like the new look quite a bit! Is there going to be any updates to the “Portable ID” feature to make it like how it is on MyGamerCard.net on the 360 side of things? I like this Idea, but please IM BEGGIN’ add more psn avatars. on a side note, I hate the HOME reference “SOON”. Its like for us that have been waiting so long that arent blessed enought to have gotten a closed beta invite If you’re not mentioning an exact date then dont say anything about it at all. Wow I’ve witnessed the end of the PlayStation Underground, what’s next GAP? I mean you might as well dissolve the GAP it’s pretty much useless at this point. Especially since random individuals that never use their PS3’s are getting access to HOME before registered PS3 users who are apart of the GAP (slap in the face anyone?). Anyway I’m glad to hear you guys are taking the PSN seriously and happy to see it evolve in the way that it has. I’m hoping to see the ability to see PSN messages via the webiste and personal messages from the message boards sent to our PS3s if we decide too have that enabled. Things are certainly coming along nicely. But there is one thing that would be awesome. 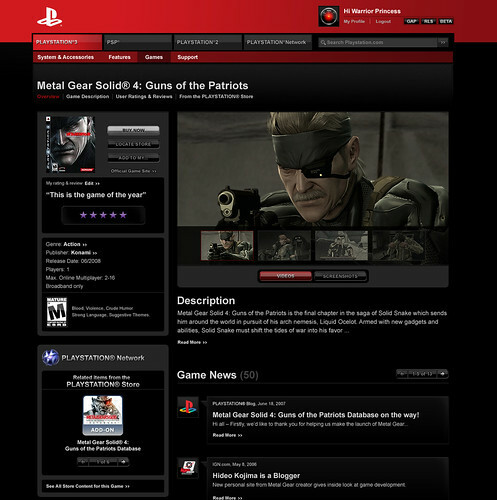 It would be the ability to send messages to your friends playing PS3 while you are on the PlayStation website. Anyone like this idea? You guys continue to give, and I love it. I love the idea that you guys are coming up with and the implementation. Now where are those G.A.P. invites? My question is, when we log into PlayStation.com or the PlayStation blog will it display out PSN Avatar? Also will the PlayStation Forums be getting an update aswell, too enhance are PSN usage? Any plans to get add trophies onto these portable ID cards that automatically sync?